Huron, S.D. (August 31, 1952) - Take it from “Moke” Cosby, the tub-thumper for National Speedways, you'll never miss Frank Luptow Monday and Tuesday at the South Dakota State Fair auto races. “Our field this year is probably the fastest we've ever had at the South Dakota Fair - and the best balanced,” Cosby said Saturday, in Huron to lay plans for the two days of auto racing. “If Frank were here, he would really have his hands full. We have nine Offies - at least - in the field. Even Bill Holland is having trouble winning from these guys,” Cosby commented. And Campbell isn't the only ace to be here. Luptow, long a State Fair favorite, is in the East, driving on the AAA stock car circuit, but a powerful field will be on hand, including the nine Offenhausers, a McDowell, the Lawhon Special and two cars with giant Ranger aircraft engines. Time trials for the events will start at 1:30 p. m., with the first of six events starting promptly at 2:30 p. m. The races are officially sanctioned International Motor Contest Association championship events. Competition in the IMCA is now the keenest in the organization’s long history. Gone are the days when one driver such as Luptow, Deb Snyder, Emory Collins or Jimmy Wilburn dominated the field to win event after event. Today, any one of 10 drivers are liable to win the feature event and the records set by the above-mentioned immortals have been broken to smithereens. The track record here is 24.85, set by Deb Snyder in 1950. 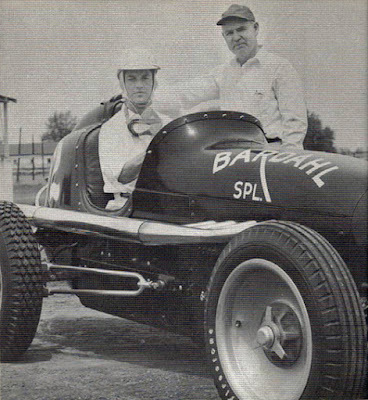 Heading up the field here at Huron are Holland and Bobby Grim, who are battling it out for the National Circuit point lead, with the Indianapolis youngster holding a slight lead over the famed “500” winner. Right behind Grim and Holland is the sensational newcomer Campbell, the racing farmer from Bates City, Mo. Campbell, in his second year of big time competition, is blazing his way to the top of the IMCA in his brilliant #25 flamingo-pink Offenhauser. The Missourian has captured six feature event wins during the past three weeks, defeating both Grim and Holland, and has shattered four track records. Also performing in sensational style is Bob Slater, former midget car champion from Kansas City. On July 4, Slater roared to a new world's record for 25 laps to win the feature event at Lincoln, Neb., and last Sunday he slammed his way to a win over one of the strongest fields of the season at Des Moines, Iowa. Another up-and-coming young driver who has entered the State Fair races is Mac McHenry of Wichita, Kan. McHenry racked up feature event wins at Escanaba Mich., and Manitowoc, Wis., last week. He will drive the well-known Les King Offy. 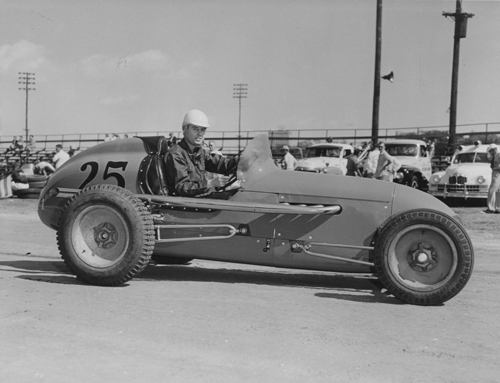 Don Branson, Champaign, Ill., who recently took over the Merle Heath Offenhauser, has also performed brilliantly during the fair circuit-racing season. He scored a win in the feature event at Manitowoc, Wis., on the second day of racing there, and has come through with numerous seconds and thirds. Other top-flight pilots on the entry list include “Red” Doyle, Cedar Rapids, Iowa, farmer national stock midget champion, who will drive the Bob Russell Offy, Phil Mocca, the tiny St. Louis, Mo., Italian- American star, who will chauffeur the Bardahl Offy and Leon De Rock, Mason City, Iowa, who will wheel the famous #7 Emory Collins-Offy.